Assaf ha-Rofe Medical Center has announced that its orthopedics department performed, for the first time in Israel, a surgery for treating children scoliosis with a method that comprises the use of a computer-driven system and a 3-D imaging system. The operation was carried out on a 8 years old girl by Prof. Igal Mirovsky, Dr. Yoram Enkstein and Dr. Yossi Samorjik. The system used was the SHILLA Growth Guidance by Medtronic. According to the hospital, the SHILLA system uses special screws that are not locked. They are placed at the ends of the structure rods. This particular feature allows the rod to slide through the screw head as the child’s spine grows and, at the same time, to provide correction of the spine’s deformity. The screws installation is done with the assistance of a computer-driven guidance system and the O-ARM device that allows a three-dimensional scanning of the operating table. The use of such systems makes it possible to install the implants without a full exposure of the spinal vertebrae, thus preventing damage to its correct growth. 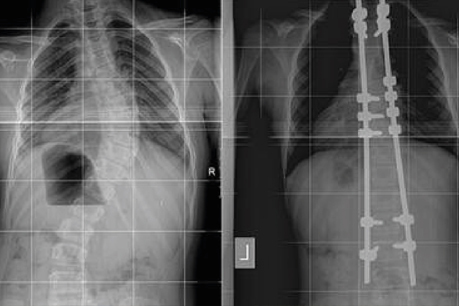 The early development of deformity (scoliosis) prior to the age of 10 is challenging for the treatment. The usual operation of severe deformity is spinal fusion, but in children who are still growing this method causes a partial halt of growth. The previous surgery approaches often demanded two operations per year (i.e. every six to nine months) for the duration of the child’s growth. Dozens operations are carried our every year at the Assaf ha-Rofe Medical Center for correcting spinal deformities, primarily juvenile scoliosis. However, the situation of the scoliosis development already at the kindergarten or junior school age is quite rare. Such heavy deformities harm the child’s future quality of life, including severe aesthetic damage to the body appearance and sometimes even serious social damage. So far, the only alternative was to perform repeated surgeries and thus to exposure the child to excessive hazard with respect to his/her growth. From now on, there is an additional option that would not harm the child’s growth. The technology employed in the operation makes it possible to treat juvenile scoliosis even in patients younger than 10, whose spine has not yet matured and who have been diagnosed with early formation of advanced severe spinal deformities. According to the hospital, the new system permits to offer effective management and maintenance of the spine’s corrections in parallel with the child’s natural growth for the efficient dealing with the problem without the need in repeated operations. The surgery performed on the girl has proven to be successful. She was released to her home after spending less than a week at the hospital. The girl is expected to stay under standard medical monitoring without the need for invasive intervention until her body ceases to grow. Only towards the age of 15 physicians will offer the girl to replace this device in a standard fusion surgery that is accepted at an older age.